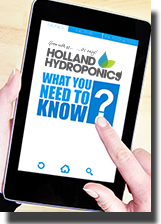 A variety of accessories and tools to help with all aspects of hydroponic growing, including netting, drying racks, jugs, yoyos and glasses. Zip-Zag Brand manufactures the finest quality and most effective storage bags we've come across. They form a tight seal that prevents smells from escaping, no matter how pungent the material! Manufactured in Canada from high-quality plastic, these zip bags will ensure that the contents stay fresh and that the surrounding atmosphere stays free of unwanted odours. Zip-Zag Brand bags shouldn't be compared to cheaper alternatives available in the supermarket that are designed to be used once and then thrown away - Zip-Zags can be used again and again and won't perish or tear, making them a much better investment. This large capacity, tiered drying rack is an essential piece of equipment for any indoor grower, whether a professional or hobbyist, for drying your favorite fruits, flowers and herbs at harvest, and comes in either 6 tier or 8 tier. The MABO Fire Extinguisher is self-activating and a great safety addition to any grow room or space, giving you peace of mind that if the inevitable happens, it'll be under control without you having to be in the same building. The LUMii Head Torch allows you to tend to your plants during the lights out period thanks to the green spectrum of light and the head torch means your hands are free to do whatever jobs you need to do! Bamboo Cane for supporting plants. Batteries are always something you forget about, but many of our products will still need batteries. For example pH pens, EC pens, torches, digital thermometers... The list goes on! Keep these on hand so you'll never be caught short without batteries. Bendz are a reusable training device.